When you work as hard as you can and as much as you can to make your first album, and you don’t make any money, then you change things. When I was on a major label I felt obliged to say yes to every interview, tour and whatever else. The label is always telling you, ‘This ain’t going to last,’ so I worked myself half to death. I learnt from that and I like to pace myself now. Since the decline of record companies and music sales, I’ve always played live. Prison’s a walk in the park compared with being sectioned, mate, it really is. It’s good to play 100 per cent live – no tricks, no samples, no messing about. It may be a coincidence, but from the minute I took anti-depressants, I didn’t pick up a guitar or a pen for seven years. I’ve been told I sold 110m albums and singles. If that’s the case, I should’ve come here in a space rocket. I’m blind without my glasses. I really knew I wanted to be Adam, because Adam was the first man. Ant I chose because, if there’s a nuclear explosion, the ants will survive. I feel very grateful to be alive and well enough to make music. I didn’t lose my virginity until I was 18 The first time was a nightmare. Who shows you how to use a condom? 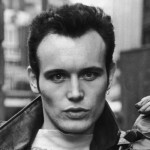 Adam Ant is an English musician who gained popularity as the lead singer of New Wave/post-punk group Adam and the Ants and later as a solo artist, scoring ten UK top ten hits between 1980 and 1983, including three No.1s. Ant was also a star in America where he not only scored a string of hit singles and albums, but was once voted sexiest man in America by the viewers of MTV. He is also an actor, having appeared in over two dozen films or television episodes between 1985 and 2003. Since 2010, Ant has undertaken a major reactivation of his musical career, performing live regularly in his hometown London and beyond, recording a new album and with two full-length UK national tours, a US national tour and a short Australian tour all now completed and a third such UK tour now underway. His present comeback continues and thrives despite concerns about such activities being merely another symptom of the mental health issues which were in considerable part responsible for his lengthy spell of near-inactivity spanning the late 1990s and 2000s.